Preheat oven to 220°C/200°C Fan/Gas mark 7. Finely dice the garlic and onions (you can use the blender to get an even finer cut of onion) and place into a large mixing bowl. Break up the mince into the bowl with salt and pepper. Mix all the ingredients together using the palm of your hand to work the mince and onions together. Once combined, remove from the bowl and divide into 4 equal sized balls. Press each one down using your hand to make 4 burgers. Place on an oven tray and bake in the oven for the 20 minutes. Slice the bread rolls and lay a large lettuce leaf on the base of each so it hangs over a little, then lay the burgers on top of the lettuce. Cut each cheese slice along one edge into triangles so it looks like teeth. Lay on top of the burger so it hangs over the edge. Squirt some ketchup down either side of the cheese slice so it comes out the sides (like blood!). Top with the bread roll lids, wedge two slices of gherkins into the top to look like eyes and some orange pepper shaped like fangs behind the gherkin eyes. Ta da! 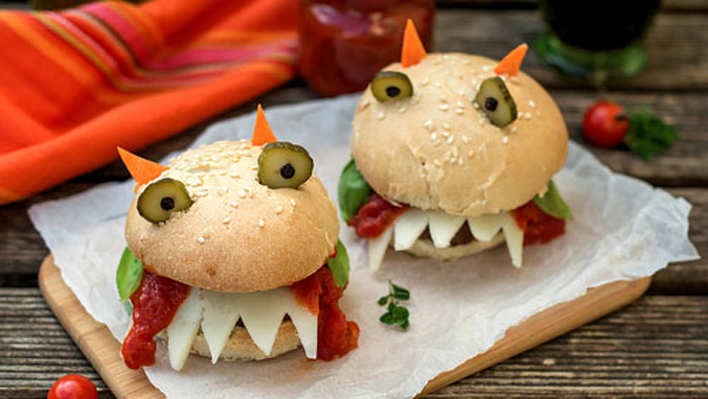 Healthier burgers with scary faces for the kids. Cut the pumpkin into chunks. Heat the oil in a large pan over a medium heat, then fry the onion, garlic and cumin for 2-3 minutes until the onion starts to soften. Add the pumpkin and potato and cook, stirring for 5-6 minutes. Add the leaves from the thyme sprigs (or use dried) to the pan. 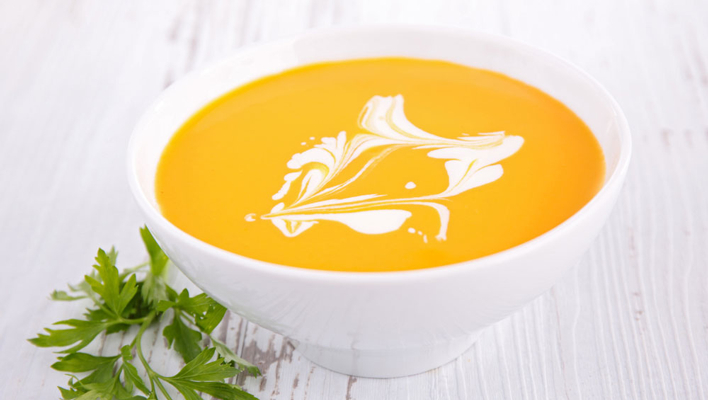 Pour in the stock, reduce the heat to low and simmer for 15-20 minutes, until the pumpkin and potatoes are soft. Add the mixture to a food processor or blender and blitz until smooth, then pour into a pan, heat through and season. Serve each portion with a tbsp crème fraîche, lightly stirred in. 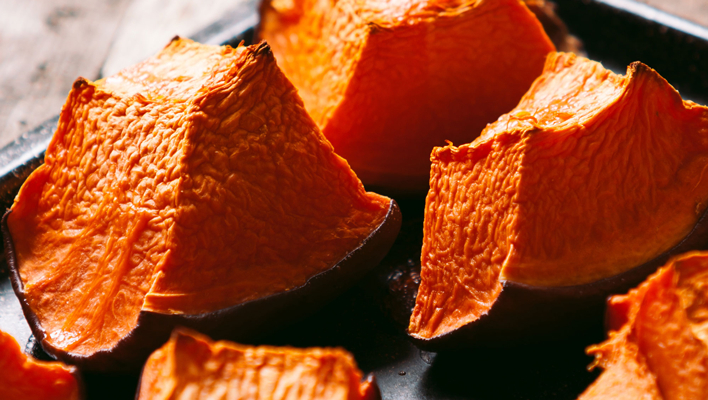 Chop the pumpkin into chunks or wedges, with its skin on, and place onto a baking tray. Spray all over with the Frylight and season with the garlic salt. Roast in the oven for 35-40 minutes until soft and starting to brown. Peel the pumpkin, remove seeds and fibrous bits then cut flesh into bite size chunks. Spray a large pan with the Frylight and place over a medium heat. Cook the onion for 3-4 minutes until softened. 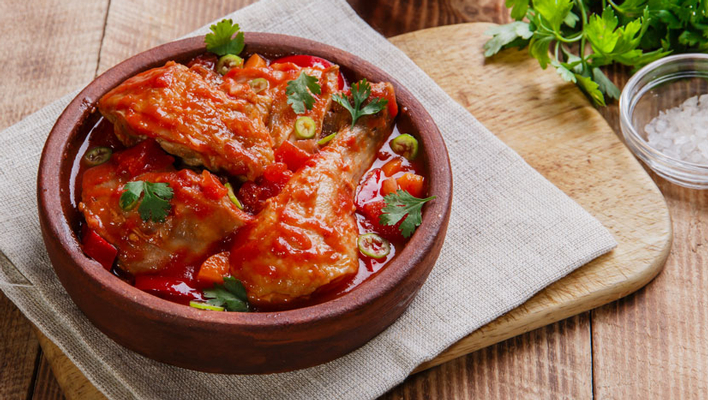 Stir in the ginger, cinnamon and chicken pieces, and cook for a further 5-6 minutes, turning the chicken regularly to ensure it's cooking on all sides. Add the tomatoes and harissa, season and stir. Add the chickpeas, pumpkin and 5 tbsp water and mix well. Reduce the heat to low, cover and cook for 20-25 minutes or until the pumpkin is soft and chicken is no longer pink in the middle. Add more water if needed. Stir in the coriander before serving. Cut the bananas in half midway through so each half has a flat end and stand on a plate upright. Near the pointy end place a few chocolate drops on as eyes and a mouth – use the pointy end of the drop to push it in to the banana. Peel the clementines and keep the fruit whole. Halve a celery stick length ways and chop up 4 inch long pieces. Then pop a celery stalk into the top of each clementine so you have mini pumpkins. 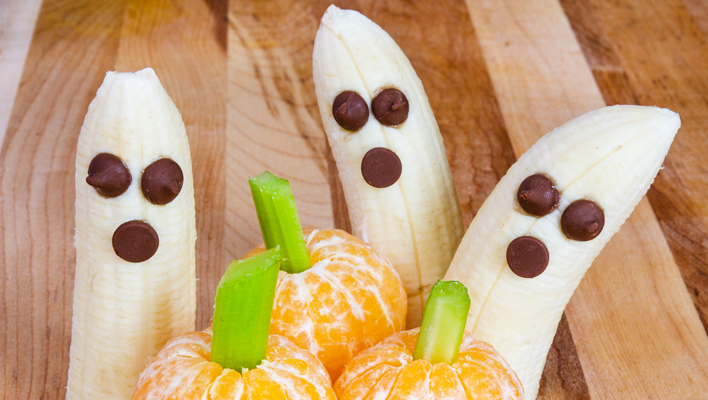 Serve each person one banana ghost and one clementine pumpkin. Preheat the oven to 180°C/160°C Fan/Gas mark 5. To carve, cleanly slice the top from each pepper and set aside to use as lids. Remove the seeds and white bits from the inside. 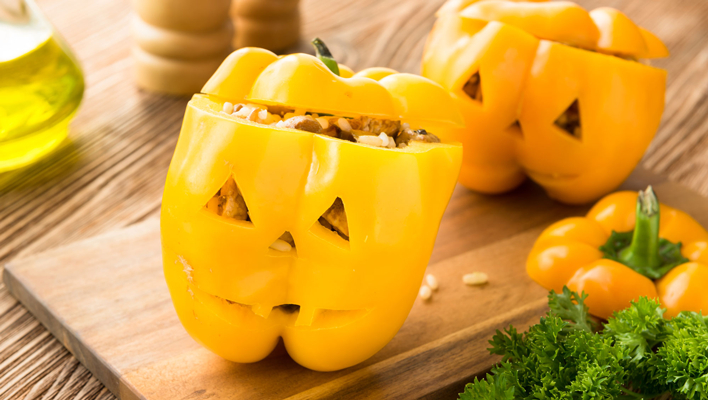 Use a sharp knife to carve a face out of one side of the pepper. Fill each pepper with 100g cooked rice and top with some grated cheese. Replace the pepper 'lid' and bake in the oven for 15-20 mins until the pepper is tender and the edges are turning a little brown. To keep it upright, stand the peppers in a muffin tray. Cut the pastry sheet into 20 strips lengthways, using a sharp knife. Start from the base of each sausage and wrap the pastry around the sausage moving upwards, so it wrapped up like a mummy, leaving just a little gap for the face at the top. 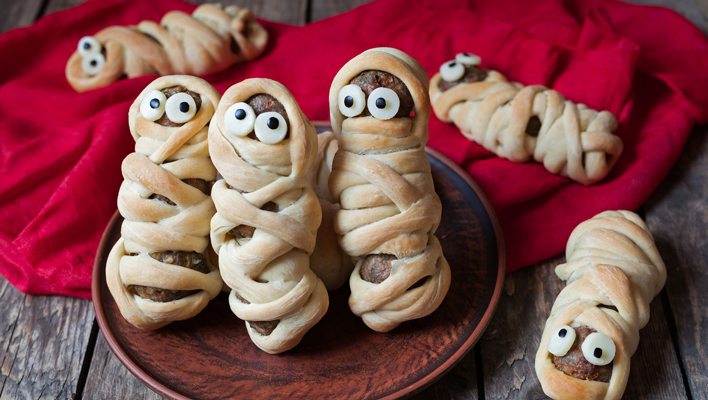 Brush each mummy with egg wash and pop them onto a baking tray. Cook in the oven 15-20 mins until the pastry is golden and crisp. Once they've cooled, stick the white chocolate drops on as eyes with the icing and put a black dot in the middle for the pupil. Cut the apples in half and remove the core. Cut each half into 3 slices. If making these up in advance, use lemon juice on cut areas of apple to minimize browning. Spread half a tbsp of peanut butter onto one side of each apple slice, letting it flow over the edges a little. 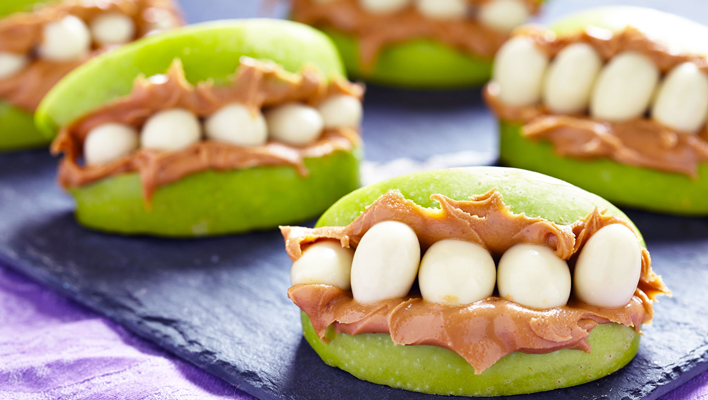 Place two apple slices together at an angle, with the peanut butter on the inside, to create a mouth. Repeat for the leftover slices. Place the raisins inside the gap, in the peanut butter, as the 'teeth'.